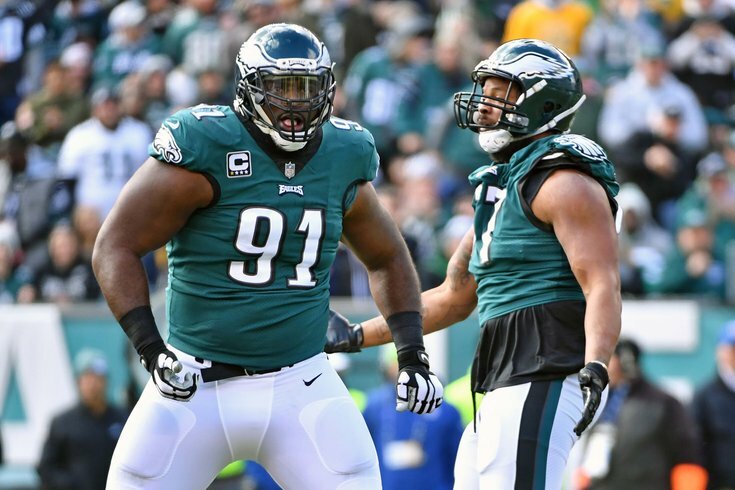 Philadelphia Eagles defensive tackle Fletcher Cox and defensive end Michael Bennett. Each Friday for PhillyVoice, Steve Maltepes, known as “The Philly Godfather,” will impart his gambling wisdom on the Eagles and where the smart money is going on various pro and college football games this weekend. Maltepes is one of the nation’s hottest sports betting experts who appears weekly on national radio and has his own website, www.thephillygodfather.com. What is the line telling you: The oddsmakers and offshore books implemented the Eagles as 2-point favorites and the combined total at 41 for this London game. Since then, we’ve seen a full 1-point adjustment, and as of right now, the line is set at 3 for the Eagles offshore and out west in Vegas. The early market reports were showing that 70-percent of all tickets punched were on Philadelphia, but as we all know, 90-percent of the recreational money arrives on game day. It’s not easy backing my home team after the 17-point, fourth-quarter meltdown in such a huge emotional loss to the Panthers, even though we were on the Panthers last week. We didn’t expect the Panthers to win outright, we just thought that they would cover. They found a way to come back in the fourth quarter, which was bad news for all Philadelphia fans. The Eagles and Jaguars are mirror images of each other when it comes to offensive and defensive metrics. Philly is slightly better on the offensive side, while the Jags are slightly better on the defensive side. Both of their offensive lines have struggled. They’ve given up a combined 40 sacks this season. Both defensive lines have literally played below the league average of the adjusted sack rate. Carson Wentz is the much better quarterback than Blake Bortles. Bottom line: The smart money likes the Eagles at minus-2, 2.5. What is the line telling you: The oddsmakers and offshore sports book opened with the Lions at minus-3 with a combined set total at 49. Since then, we’ve seen little market on the line, but the side has been bouncing around with Detroit as low as minus-2 on Monday, before we saw a surge back to that key number of 3. The early market reports were showing that 57-percent of all tickets placed are on the Seahawks, and the overall money waged was top-heavy on the Seahawks with 65-percent of the total cash. The Lions offensively have the slightly better efficiency numbers, but the disparity on the defensive side is huge. The lean is Seattle, even though the Lions do have some quality wins. Bottom line: The smart money likes the Seattle plus-3 and also likes the over, if it’s at 48 or 49. What is the line telling you: The oddsmakers and offshore opened this line with Carolina being a 1-point home favorite with a combined total of 43.5. Since then, we’ve seen a slight uptick to 44 across the board on the total. The bigger move, however, has been on Baltimore as we’ve seen the sharp money attack the screen early and often and force bookmakers to adjust their price by 3.5 points. The Ravens are now 2.5-point road favorites. The early market reports were showing 57-percent of all tickets punched were on the Panthers, while 65-percent of the total money wagered was on the Ravens. The sharp money is all over Baltimore here. Carolina left a lot on the road last week in its great fourth-quarter comeback against a very physical Eagles’ defense. The Panthers are playing arguably the best defense in football that has given up the least amount of yards per/play (4.5 ave.) and per/pass attempt (5.5). The Panthers greatest strength has been their run game, but they’re going up against a Ravens’ defense that only gives up 2.8 yards per/rush attempt. It’s just a bad matchup for Carolina. The sharp money is all over the Ravens. Bottom line: The smart money likes the Ravens minus-2.5.